At Mark Your Space, we take pride in a job well done. And if it doesn’t come out the way you expect, we do it again until you’re satisfied. Here’s a story about one very happy customer. Mark Your Space is dedicated to your business success. Get professional car wraps for your vehicle fleet. Contact us or give us a call at (630) 289-7082. Serving Chicago and the surrounding area. 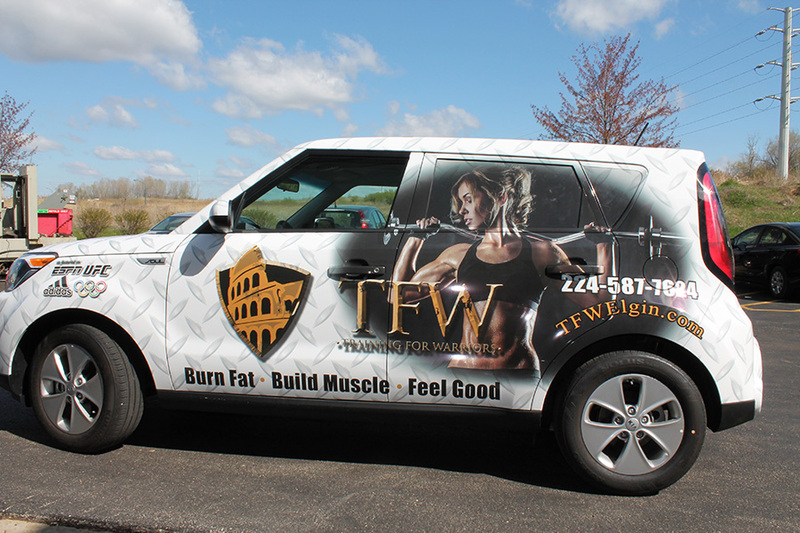 Our customer, TFW is a specialized fitness trainer. Owner Fred Moreno came to us since he knew car wraps would help his business visibility. So we sat down and came up with a design that he liked. Then we applied the wrap in our environmentally controlled shop. Environmental control is vital to make sure dirt and air don’t get under the wrap. This makes for a smooth, clean finish. We also only use top grade materials that last long and resist moisture and sunlight damage. The problem showed up when Fred’s vehicle was seen out in the sun. The black finish had a greenish tint to it that we couldn’t detect under our shop lights. Fred wasn’t satisfied. So what did we do? We stayed on the job until we got it right. We went back and redesigned the car wrap. Then we removed and replaced the prior work. This time we outfitted the vehicle in white, and it came out perfect. Look how great Fred’s Kia looks now. Even smaller vehicles can pack a punch with fleet graphic advertising. Fred takes advantage of his transportation and makes his brand known around Chicago. We appreciate Fred’s patience. At Mark Your Space, we want you to look your best so your business can grow. Vehicle wraps are one of the most cost effective ways to get noticed. The graphics application process is fast, and we even help you with design ideas. And if it doesn’t come out exactly as you like it, we’ll do it over again. Want to take advantage of your vehicle to increase brand awareness? Then contact us or give us a call at (630) 289-7082. We serve Chicago and the surrounding area with the finest fleet graphics.